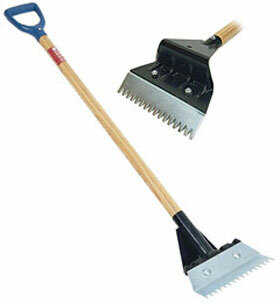 PRODUCT: AJC-117-SGS, Shingo Tear off Shovel with 47-1/2 inch Ash Wood Handle. Price/Each. (aka SGS-117). DESCRIPTION: Features a 47-1/2" top grade white ash handle with D-Grip. Replaceable carbon-steel heat treated skid plate to reduce wear on fulcrum of shovel is optional.